The Best Software for Your Business: Quicken or QuickBooks? When deciding which accounting software is best for your small business, the choice often comes down to either Quicken Home & Business or QuickBooks Simple Start. Both offer effective tools for handling accounting in a small business, but there are differences to be considered—especially if you also want to manage personal finances and business finances all in one application. As you make that decision, take each product's features into consideration. Dedicated Vs. Dual-Use: Quicken Home & Business includes a multitude of features for personal finance management along with small business features, which appeals to those who want all of their financials in one place. QuickBooks Simple Start only has features relevant to small business accounting. Without the distraction of personal finance features, it is easier to learn to use QuickBooks Simple Start. Look and Feel: Because QuickBooks Simple Start focuses only on helping you with small business accounting activities, it has a simpler interface than Quicken Home & Business and is easier to navigate. Account Reconciliation: Account reconciliations in Quicken Home & Business start from within account registers, and adding or changing transactions during the reconciliation process is uncomplicated. Account reconciliations are handled somewhat differently in QuickBooks Simple Start, and while not difficult, the process is not as intuitive as it is in Quicken software. Downloading Transactions: Both QuickBooks and Quicken Home & Business offers the convenient ability to download transactions from your bank, credit card and investment accounts (provided that your institutions support this). Categories: Quicken Home & Business uses income and expense categories, while QuickBooks Simple Start uses expense accounts and income accounts to classify transactions by standard double-entry accounting procedures. The income and expense accounts look like categories to those familiar with personal finance software, but double entry accounting is not always as simple as recording a check. 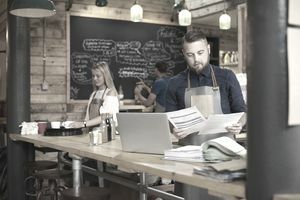 For example, if a check is written to purchase new equipment for the small business, an asset account needs to be established for the equipment. Quicken Home & Business or QuickBooks Simple Start? Quicken Home & Business and QuickBooks Simple Start both address small business accounting needs, but QuickBooks Simple Start is a dedicated small business accounting software application, and it will better serve a growing small business. QuickBooks Simple Start is better at quickly guiding you through small business transactions, where Quicken Home & Business works well for someone who uses Quicken for personal finances and who makes an occasional sale with a handful of customers. We recommend using QuickBooks Simple Start if you are very serious about your small business, and you have a plan in place for growth. When your business grows, QuickBooks Simple Start data will transfer to higher versions of QuickBooks with richer business accounting features. If you use Quicken for managing personal finances and you frequently have small business accounting transactions, your best bet is to use Quicken Deluxe or Premier for personal finances and QuickBooks Simple Start for small business finances. Learn more about QuickBooks Simple Start and get the free download.